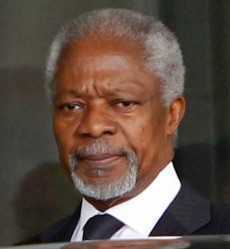 Kofi Annan, a former United Nations Secretary-General has died. He was 80 years old.Nyaniba Tv understands that the global statesman died at a hospital in Switzerland, early Saturday morning after a short illness. According to a statement copied Peacefmonline from the Kofi Annan Foundation, "his wife, Nane and their children Ama, Kojo and Nina were by his side during his last days." The statement further adds that "the family requests privacy at this time of mourning. Arrangements to celebrate his remarkable life will be announced later. "It however, stopped short of indicating whatever ailment the noble statesman was afflicted with.